Our Air Velocity Transmitters EE75 Series has a huge demand in the market due to its sturdy construction and high efficiency. These products are widely appreciated among our clients and we provide them in different specifications as per the requirement. Our Air Velocity EE75 Series is extensively used in numerous industries for diverse applications. We also offer them in various customizations to meet the different customer demands. The EE75 Series Air Velocity Transmitters were developed to obtain accurate measuring results over a wide range of Velocities and Temperatures. A high-quality hot film sensor element based on cutting- edge thin film technology ensures maximum sensitivity, even at lowest mass flows. At the same time, the innovative probe design produces reliable measuring results at high flow velocities of up to 40m/s (8000fVmin). The integrated Temperature compensation minimizes the Temperature cross-sensitivity of the EE75 Series which, combined with the robust mechanical design, allows it to be used at process Temperatures between -40 to 120°C(-40 to 248°F). In addition to Air Velocity and Temperature values, the Transmitter calculates the volumetric flow rate in m3/h or ft3/min. The cross section of the duct needs to be determined for this purpose and the volumetric flow rate can be displayed and directed to one of the analogue outputs. 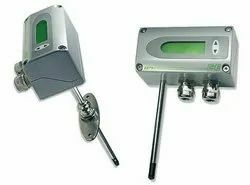 The EE75 Series can be used to measure the velocity of other gases as well, although a correction has to be applied to the unit at the factory. Backed with immense experience and understanding, we are recognized as one of the most prominent importers and exporters of Transmitter that offers stable and reliable Humidity and Temperature measurement. Be it in international or domestic market, our given Transmitters are cherished and acknowledged over the global platform. The entire array of Transmitter is checked upon a series of norms so as to assure its quality. Besides, we offer the Transmitter in a huge array of stipulations as per the requirements of our patrons. The HygroFlex1 series is the latest development in inexpensive HVAC transmitters for relative Humidity and Temperature. The devices are equipped with the tried-and-tested Hygromer® IN-1 sensor and boast unbeatable value for money. 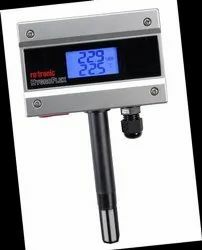 The optional ROTRONIC SW21 Software enables you to scale, calibrate and adjust (only Humidity) the Transmitter. Looking for Humidity and Temperature Sensors ?